Posted by Maria Perilli on June 4, 2013. We’re in! 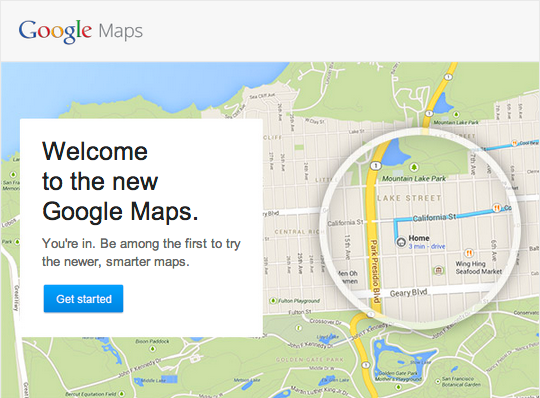 We just got the invite to try the new Google Maps, took a test drive and wanted to share some of the new features with you. Though current browsers only support the Lite mode of the new Google Maps and we don’t have access to all the 3D functionality, like buildings and Earth view, we were still able to explore many of the cool new features. The “new, smarter search box” not only helps you find places, you can also view your recent searches, directions and transit, traffic & bicycling information where available. We searched for pizza in Fort Lauderdale. Results located on the map. You can now view results for broad searches like “pizza, Fort Lauderdale” directly on the map. Google Maps automatically highlights the most relevant results with unique icons that identify the type of business at a glance. New info cards provide detailed business information, reviews and ratings. You can also see directions and save the destination to revisit later by starring it. A more robust Street View is still available with just one click. In addition to Street View, there is a new carousel at the bottom of the search results screen that include photo tours of the area and more through vivid imagery. We can’t wait until the complete new Google Maps is rolled out, and are interested to see how it affects some features of Google AdWords. Need help with pay-per-click management? Call PPC Professionals today to learn how we can transform your AdWords account into a success guaranteed to increase your ROI.